Diverse activities were realized during the project by the participating libraries. Some of them accompanied by materials provided are listed below and available for download. Manual “Libraries for all – European Strategy for Multicultural Education” is one of the results of the project run between Sweden, Austria, Germany and the Czech Republic. The handbook is now available for download in four language versions. Sweden, Austria, Germany and the Czech Republic. They are now available for download in four language versions. Offer of free "low treshold" language courses in Prague during autumn 2010. The Multicultural Center Prague and the Municipal Library in Prague prepared an exhibition "My home" of foreign artists living in Prague. The exhibition was held in September 2010 in the Municipal Library branch in Opatov. There are a lot of foreigners living in Prague, some of them devote their free time creating something artistic which is new and original. It often happens however, that foreigners don’t have all the necessary contacts or enough money to exhibit their work. The aim of the unique exhibition “My home” was to give a possibility to foreigners to demonstrate their creative achievements and to acquaint the public with those people for whom the Czech Republic has become a temporary or a permanent home. The exhibition was placed in all halls of the Municipal Library branch in Opatov, including study halls and children’s section where the work of children from foreign families was also presented. Selection of the artworks is to be seen in following presentations. The latest newsletter from IFLA&apos;s Section on Library Services to Multicultural Populations with the article on Libraries for All/ESME. The mid-term report of ESME project (European Stretegy for Multicultural Education) is available for download. This report introduces project objectives, outcomes and results as well as plans for the future. The reporting period covers activities effectuated from 01/10/2008 to 31/08/2009. Available in English language only. The Public Library of Frankfurt am Main presents one of the project products: Intercultural reading activity box (Aktionskisten Interkulturelle Leseförderung). 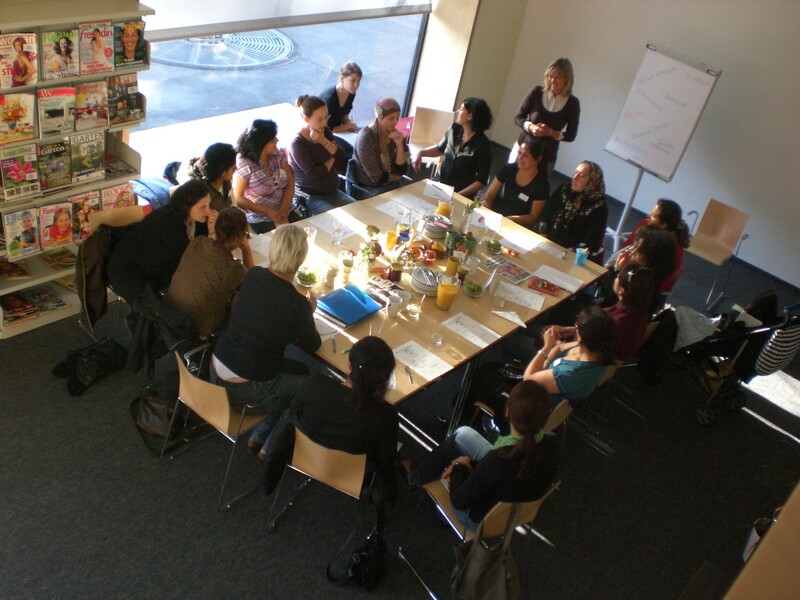 PHOTO: "German for breakfast"/"Deutsch zum Frühstück"
OKAY presents picture from the first “Breakfast”-Meeting of the women. Publication for parents and children "Lies mir vor und spiel mit mir!" OKAY prepared a new book for parents and children "Lies mir vor und spiel mit mir!" The Multicultural center in Prague and the Municipal Library in Prague prepared a photo presentation of their local project activities. The article on regional project in Austria was written by Michaela Hermann, a librarian in one of the two pilot-project-libraries in Austria. The article was published in the journal "Büchereiperspektiven" (Austrian Association of Libraries). View a selection of photos from the Handicraft Day, a multicultural event held at Biskopsgården&apos;s library and Folkets Hus Biskopsgården.